With various presenters and recipients making bitter jokes (or delivering heartfelt laments) about the recent election results, last night’s Bafta TV Awards occasionally felt more like a wake than a glitzy showbiz back-slap! Sadly, none of the shows I was rooting for actually won anything… and seeing Game of Thrones trounced by Sherlock for the Radio Times Award was especially dispiriting (though that one was decided by public vote, and I didn’t participate, so I’m partly to blame…). 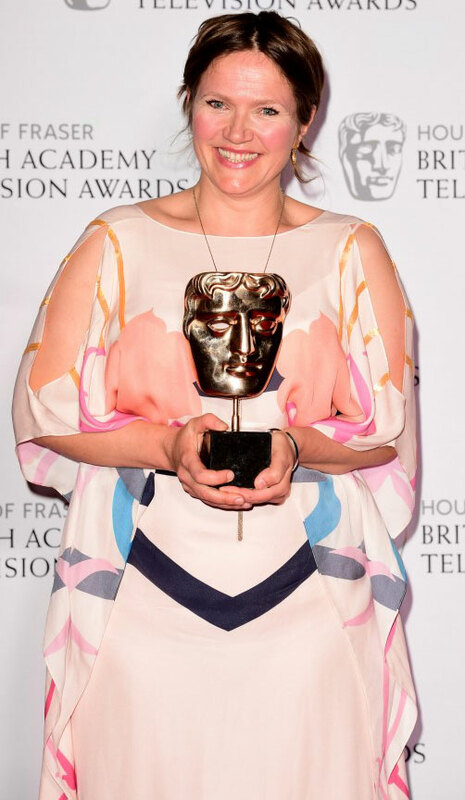 As for the women who did win: After accepting her award for Best Female Performance in a Comedy (W1A), Jessica Hynes made a rather emotional political speech, informing the audience: “I’m from a single-parent family, and my Mum was a full-time worker to support me and my sister… I’m really worried about the cuts that are coming to state education for people in low-income families. Because I don’t think low-income means low talent or low education or low intelligence.” Amen, sister. Still, my fave acceptance speech was probably the one Georgina Campbell gave, after recovering from the shock of hearing her name announced as Best Leading Actress (Murdered By My Boyfriend). Although she seemed rather like a rabbit-in-the-headlights behind the podium, she graciously praised her fellow nominees, thanked all her colleagues, and paid tribute to the real-life victims of domestic abuse whose stories inspired and informed the script, and her performance. On the male side of things, it was nice to see Clive James receiving a Special Award (presented by Charlie Brooker!) for his contributions to television comedy and criticism over the years. The archive clips reminded me how hilarious his late-night shows used to be, and how they always sent me off to bed with a smiley face and aching ribs… so, hearty thanks and best wishes to him. This entry was posted in Rants about TV and tagged Charlie Brooker, Clive James, Game of Thrones, Georgina Campbell, Jessica Hynes, Maisie Williams, Murdered By My Boyfriend, W1A. Bookmark the permalink.